Provide comfort for the family of Bobby Riley with a meaningful gesture of sympathy. Mr. Bobby J. Riley was born on November 4, 1941, the youngest of eight children, to parents Prince & Verena Davis Riley, in Greenville, South Carolina. Bobby was educated in the Greenville County Schools and graduated from Sterling High School in 1961. After high school, from 1963-1966, he attended Elizabeth City State College (ECSC); Elizabeth City State University (ECSU 1969), in Elizabeth City, North Carolina. While at ECSC he was an outstanding student both academically and athletically. In football, Bobby was a four-year-starting guard and tackle on offense and defense. During his sophomore and junior year, he was the leading tackler on the ECSC Vikings football team. 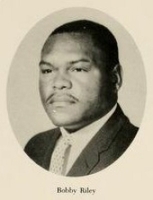 Bobby made ALL-CIAA in 1963 and 1964. He was drafted by the Charleston Rockets of the Continental Football League. Bobby graduated from ECSC in three and a half years with a Bachelor of Science degree in Industrial Arts. Years later, he received his Master’s of Arts and Educational Specialist degrees in school Administration and Supervision from Clark Atlanta University and Jacksonville State University, respectively. Bobby met his future wife and life-partner, Sylvia Austin Riley while working in North Carolina, and the two got married on December 28, 1968. Bobby & Sylvia lived and loved life to the fullest, and traveled quite often, until she predeceased him just three days after their 49th wedding anniversary. Bobby, although dealing with his own health issues, pressed on and tried his best to adjust to living life without his soulmate. He did his very best, and fought a hard fight, but sadly, he lost his fight on Wednesday, April 10, 2019. Bobby realized his love for Jesus Christ early in life and joined Mt. Pleasant Baptist Church in Williamston, SC. Also, in his living years, Bobby was an Elizabeth City State University (ECSU) Legacy Society Policy Donor; the catalyst and early organizer of ECSU’s Atlanta Metro Alumni Chapter (AMAC), and a Lifetime ECSU National Alumni Association member. He was an extraordinary planner and entrepreneur, a gifted financial advisor and secretary, a persistent leader; generous supporter, and Omega Psi Phi Fraternity brotherhood member. Bobby J. Riley, a lifelong educator, scholastic baseball player, athletic coach (football and track), and graduate of the class of ECSC, ’66, in the Industrial Arts Program, made a planned gift of $25,000 to create a scholarship endowment to support Industrial Technology at Elizabeth City State University. Before retiring, Mr. Riley as a school administrator in Atlanta Public Schools (APS), received numerous leadership appointments for his involvement in Technology Education, to include: NASA’s VIP Educator’s Conference, and the second launch of the Space Shuttle Challenger participant; President of the Georgia Industrial Technology Education Association, and a delegate of the United States Educators for Science and Technology Education Exchange with educators in China, and a participant of the United States/China joint conference on education in Beijing. Bobby successfully retired from education in 1999 as an Assistant Principal of Alonzo A. Crim Comprehensive High School in Atlanta, GA with 33 years of service. In addition to his affinity for technology, Bobby maintained a commitment to the university and several other key areas, including athletics, through various means of support. He was a 1982 member of the Elizabeth City State University’s Sports Hall of Fame, and has received numerous accolades for his service, which include: Georgia-International Technology Education Association Teacher of the Year in (1988), the Outstanding Achievement in Education Award from the National Alumni Association at ECSU (1987), and the Distinguished Alumni Award from the National Association for Equal Opportunity in Higher Education (NAFEO). He was a member of Epsilon Pi Tau International Honor Society for Technology Professionals. Mr. Bobby J. Riley is survived by a loving and devoted son, Bobby Lamont Jones-Riley; two sisters, Nellie Goode of Greenville, SC and Annie Williams of Jamaica-Queens, NY; two sisters-in-law, Shirley Haynes (Reverend John) of Richmond, VA, and Patricia Sims (Lester) of Virginia Beach, VA; and a host of nieces, nephews, relatives, associates and many friends.